I've been a huge Joe Bob Briggs fan since his days of MonsterVision on TNT. I remember being a young kid tuning in every Saturday night watching that show. They just don't make television that entertaining these days. So when I happened upon his book, Profoundly Disturbing: Shocking Movies That Changed American History, I had to pick it up. The book is a collection of essays written by Joe Bob himself regarding such classic films like, The Texas Chain Saw Massacre, Creature from the Black Lagoon, The Exorcist, Blood Feast and many, many more. Each entry is an in depth look into the making and back stories (some famous, some not so much) of many of the films that I grew up watching and adoring. 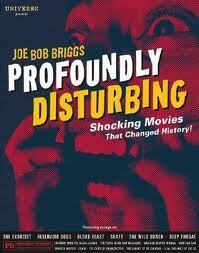 With Joe Bob Brigg's wit and his sense of humor, this book will please any horror or film fan. This book is a testament as to what kind of a fan Joe Bob really is. If you've enjoyed anything he's ever done, this book will certainly satisfy your horror reading fix. It's loaded with knowledge and fun facts from a guy who simply loves movies. Joe Bob says check it out and I agree.